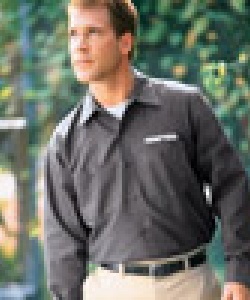 Industrial Work Shirt Long Sleeve 4.25 oz. poplin, 65/35%poly cotton,six button front closure, with gripper at neck. Two buton-thru hex style pockets w/angled bartacks, bartacked pencil stall in left pocket. Lined collar with sewn-in stays.